It can be a challenge for me to cook supper while simultaneously keeping an eye on my two children. Most of our week night meals are ridiculously simple and boring. A meat, frozen veggie and baked sweet potato grace our table more than I’d care to admit. There are many strategies to combat the “Oh my goodness, it’s five o’clock, what’s for dinner?” problem. I’ve tried many, but not with much consistency. Jessica over at the Life as Mom blog, frequently plans theme nights to help simplify her meal planning and prepping. Emily at Jones Design Company recently decided to eat the same five meals every week night. Both are ideas I can get on board with. Now that the weather is cool, soups are making their way back onto the dinner menu. So I thought I might start small, and try out a dinner theme night. Sunday Soup night it is! 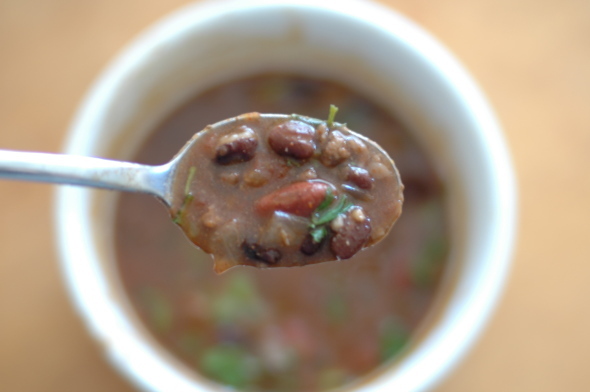 Last week we had one of our favorite soups to make this time of year, Southwestern Soup. It was featured in Southern Living more than five years ago. It is similar to chili or taco soup. I love that it is hearty and makes several servings. We could eat this soup for three nights in a row! It includes ground beef, kidney beans, black beans, diced tomatoes, and taco seasoning. It tastes great topped with sour cream and cilantro. Now that I have one week night meal planned, guess I better figure out a plan for the rest! If you have any great soup recipes, pass them along.